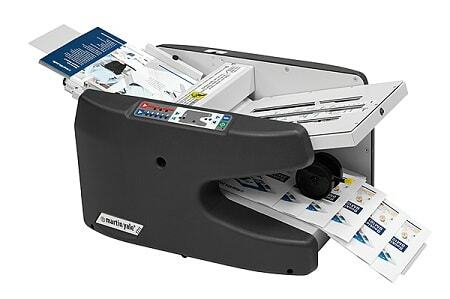 The Martin Yale 1711 Paper Folder Electronic Ease-of-Use AutoFolder is a high speed machine that automatically feeds and folds a stack of documents up to 8 1/2” x 14”. This machine is ideal for large mailrooms and offi ces when ease of use is important. It has features, such as, improved feed system, removable fold tables, easy access to rollers, improved stacking wheels, and self centering paper guides. The Ease-of-Use electronic controls automatically preset letter, legal and A4 with 5 preset fold types, with option of electronically adjusting fold tables for custom folds. Five programmed fold types can be created: letter, half, z-fold, double parallel, and gate. It operates at a speed of up to 9,000 sheets per hour and has a feed table capacity of 150 sheets.